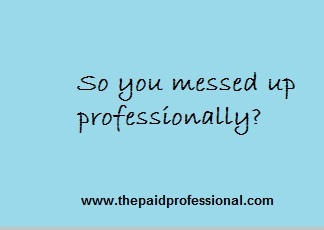 Home / personal development / professionals / SO YOU MESSED UP PROFESSIONALLY? 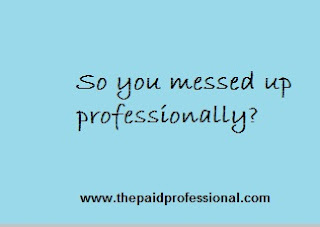 SO YOU MESSED UP PROFESSIONALLY? A life spent making mistakes is more honourable than a life spent doing nothing. Your past mistake is not a failure if you have the courage to learn from it. People make mistakes every day. In relationships, business, sports, etc. A professional is not exempted from making mistakes. Just because you are pro doesn’t mean you won't make mistakes at all. In fact, making mistakes is a sign you are doing something profound. Mistakes happen all the time. The only problem is when you make a mistake and then you conclude that you are a failure and refuse to try again. A successful person in most cases learns from his mistakes. A failure is only someone who failed and refuses to try again. He remains there. Fail is only a feedback, it doesn’t determine who you are. Fail is the most accurate feedback you can get on your way to perfecting your skills. You are only sure you have learned your lesson if you don’t make the same mistake twice. It will be foolish to make the same mistake twice. Mistakes are opportunities for growth. It is your chance to learn something new. It was said that Thomas Edison made thousands of attempts before he perfected the light bulb. A mistake is an opportunity to adjust your focus. An archer who misses a shot by an inch to the left of the target will need to adjust his focus an inch to the right. Mistakes a professional make is signal to him that he messed up and he needs to up his game. There are times when people think they are the best, not knowing that they have been outclassed by their opponents. The story of Mike Tyson is one. He was beaten by Kevin McBride on June 11, 2005, sending him into retirement. It disgracefully became his last fight. He never recovered from that loss. Mike Tyson accepted failure after his last defeat and has never returned to competitive fighting. It is true that there are mistakes you may never recover from. For instance, if you broke the heart of a devoted lover, you cheated a trusted client or business partner who later found out, or you committed a crime that made you go to jail, etc, such mistakes may be too costly to easily recover from or it might take a long time to clear the past from your tracks. Appart from the above instances, other things that require a trial and error approach you need not give up on them. In the competitive world, mistakes signals to you that you need to make an upgrade. Mistakes tell you that something is wrong that needs to be corrected. When you fail at something you are working on, try again. When you finally win, the victory is joyous and sweet. Your clients are not concerned about why you made a mistake, they only need results. It is your job to adjust quickly and correct your mistakes. It doesn’t mean you are a failure, it only means it is time for a change. Stand up and try again better. Don't fail backwards, fail forward and succeed. Kehinde Ibiyeye is a Legal Practitioner, Talent manager, and Blog Writer.